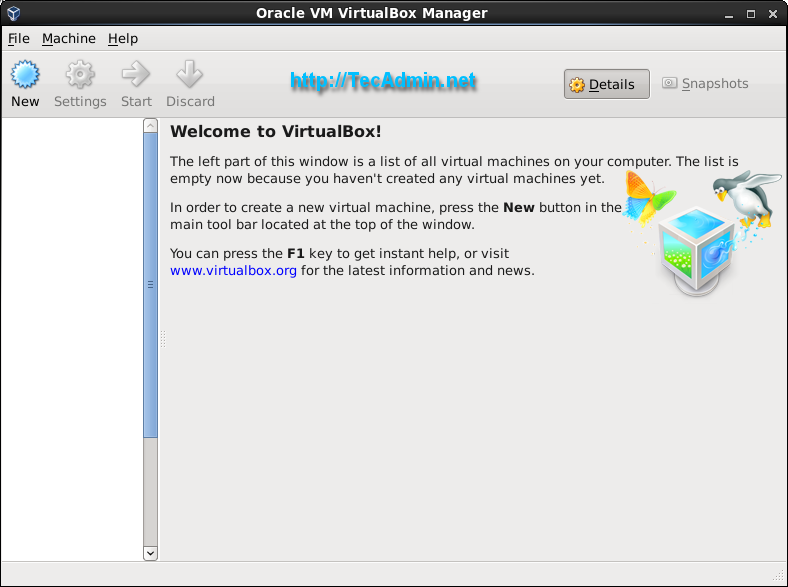 Oracle has released its new major version VirtualBox 6.0.4 . In this release VirtualBox has improves stability and fixes regressions. To read more about this release read changelog. This article will help you to install Oracle VirtualBox 6.0 on CentOS and Redhat systems using Yum. Firstly you are required to add VirtualBox yum repository in your system. Download repository file from its official site and place it under at /etc/yum.repos.d/virtualbox.repo .First navigate to /etc/yum.repos.d/ directory and use one of below commands as per your operating system. The CentOS and RedHat users also required to add EPEL yum repository using one of the following commands. Before installing VirtualBox make sure to install all required packages to run VirtualBox like kernel-headers, kernel-devels etc. Use the following command to install the required packages. After installing latest kernel and kernel headers, let’s reboot your system and start with Latest kernel. VirtualBox installation required kernel source code to install required modules, So we need to configure environment variable KERN_DIR to which VirtualBox get kernel source code. In my case latest kernel source is available in 2.6.32-504.3.3.el6.x86_64 directory under /usr/src/kernels/ . Make sure you are using correct source path. Use the following command to install VirtualBox using the yum command line tool. It will install the latest version of VirtualBox 5.2 on your system. After installation, we need to rebuild kernel modules using the following command. Use following command to start VirtualBox from X windows. You can switch to GUI mode using init 5 or startx commands from terminal. Getting this error while installing on centos7. Any idea to fix this? how to resolve this problem??? Your title is misleading. There is no Virtualbox release for Fedora 27. Hi Nibs, Thanks for your comments, I have updated the title. Actually below page was opening but its opening 26 page. Thank you, just what I needed. Worked perfect with CentOS 7. Makefile:194: *** Error: KERN_DIR does not point to a directory. Pare. vboxdrv.sh: Building virtualbox kernel services. (cann you help please ) how find the errors ..
Sep 27 17:19:16 hostname vboxdrv.sh: vboxdrv.sh: Starting VirtualBox services. Sep 27 17:19:16 hostname systemd: Started VirtualBox Linux kernel module. Hi bro, please fix epel-release-7-7.noarch.rpm or people will get 404. I love your post, btw! can you plz help me out. Yes very helpful except the ‘#service vboxdrv setup’ failed to run on my CentOS 7… any help? but I think the Virtualbox installation should still work right? Thanks much. Was so helpful! Worked great in Cent OS 7! Thanks so much! You are my savior, was planning to wipe-out OEL before I stumbled on this site. I spent a day to find a resolution to fix Vbox installation issue, mainly due to following errors. 3) For Vmware : C header files matching your running kernel were not found. Refer to your distribution’s documentation for installation instructions. Searched for awhile before I stumbled on this gem of a post – exactly what I needed to get VB up and running – Thanks! The only thing I needed to do was to enable AMD-V Support in my BIOS to install a x64 version of windows, and after that, all is good! I was setting up virtual box and vagrant in an openstack instance .After working on Centos and RHEL 7 i found the same error and stuck in same point. Need your guide on further work out. Do you think I need to fall back to old version of Centos/Rhel ( like 6 or 5) or I need to try to setup in version 7. The below error is the point i was stuck whiling configuring kernel for virtual box. 4.3.28 located in the DKMS tree. VirtualBox-4.3-4.3.14_95030_el6-1.x86_64: failure: VirtualBox-4.3-4.3.14_95030_el6-1.x86_64.rpm from virtualbox: [Errno 256] No more mirrors to try. Makefile:183: *** Error: unable to find the sources of your current Linux kernel. Specify KERN_DIR= and run Make again. Stop. Exactly what I needed after assuming that just the virtualbox rpm file would install everything authomatically! Only had to add –skip-broken to the end of the line “yum install kernel-headers …… ” as autotrace, fontforge and xdg-utils complained about dependancy problems. Virtual box runs well and imported the virtual server from one of our other hosts, no problems. Please help me with this how I can fix the error. I fixed same issue sometimes by updating kernel of our system. You may also try to update kernel of your system..
Any help with this ?? # /etc/init.d/vboxdrv setup always failed for me. Thanks for the tutorial! When I launch Virtualbox, it flashes on the screen and then disappears. Any ideas? It looks you added repository few days back. Virtualbox has updated its packages revision. Try to clean yum cache and install it again. This would prevent the error experienced by “bijay”. After running the following command I am getting error, Anyhelp will be highly apreciated. Can you please paste the content of /var/log/vbox-install.log file. Also make sure you have installed kernel-headers, kernel-devel packages and configured KERN_DIR variable. I have installed all the required packages and configured KERN_DIR variable also. Makefile:190: *** Error: KERN_DIR does not point to a directory. Stop. make: *** No rule to make target `modules’. Stop. I made a mistake on my previous reply. 2) Open the root “.bashrc” file for editing with Nano. 4) After saving the file I executed the “.bashrc” lines.